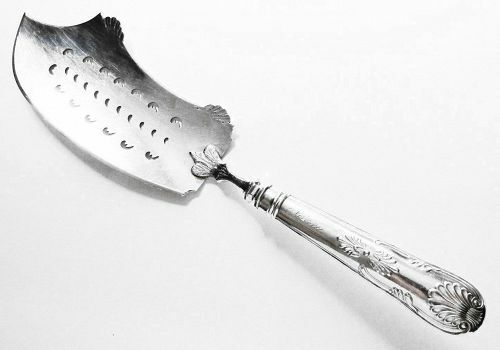 Offered is a very fine and scarce early American coin silver fish slice or server in the Kings pattern, by the noted Philadelphia firm of Robert and William Wilson, working circa 1825-50. Surprisingly little is known about this firm, despite its prominence and the great numbers of spoons and other pieces that survive bearing one of the firm's marks. This piece measures about 13 inches in length overall, with a blade measuring about 7 1/4 inches in length and about 3 inches across at its widest. The weight is approximately 228 grams. This piece is engraved in period script with the family name of the owners "Norcross". Condition on this piece is excellent, with only minor signs of normal use and no dimples, dings, dents, splits or repairs. The handle is firm and tight and the raised angle is original and correct for the piece. This piece was used rarely and lovingly. The maker's mark is struck once on the back of the blade and is clear and well-struck. Mellow old color and surface. This piece is of exceptional quality and is quite a rare form in American silver this early, especially in this condition. All in all a lovely antique American coin silver serving piece!